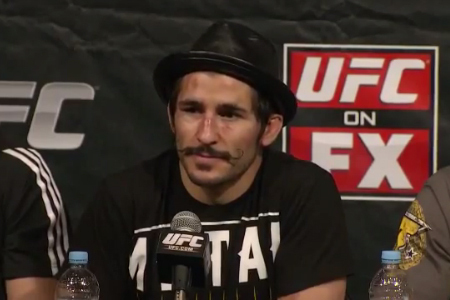 On Friday, StuNewsLaguna.com alerted the mixed martial arts world that UFC flyweight Ian McCall (Pictured) was arrested Tuesday in Irvine, California for outstanding warrants of possession of narcotic paraphernalia, possession of prescription meds without a valid prescription and driving on a suspended license. McCall is currently in Orange County Central Jail and will be held there until his September 13th pre-trial hearing. According McCall’s lawyer, George Vargas, part of his client’s incarceration comes courtesy of a misunderstanding. “Ian’s license had been suspended for unpaid traffic and parking tickets. The very next day, on June 15th, Ian went to the Harbor Justice Center with his agent, and paid over $2,600 in fines. He, mistakenly, thought that the ticket from the previous day had been handled. A few weeks later, when the court date for that case came, Ian did not show, and a warrant was issued for his arrest. McCall’s history with drug addiction and depression have been well documented. While he’s put his past in his rear-view mirror, sometimes history leaves loose ends that come back to haunt you. “Uncle Creepy” was part of the UFC’s four-man flyweight tournament to become the Octagon’s first 125-pound champ. After fighting Demetrious Johnson to a highly controversial draw in their initial encounter, McCall dropped a unanimous decision in May’s rematch.